i feel like i was eating during every waking moment of the past weekend. we had homemade fish tacos, a fancy dinner out, brunch, dessert, a brewery lunch, mexican, thai (just to name a few). we took drew's dad to our requisite favorite places, but also stepped out of our comfort zone a bit. on sunday, we attempted to drive out to a wine tasting, but drew's dad and i both notoriously get carsick (we had to turn around and go home halfway into the drive). at one point, we were so sick that we serendipitously pulled over at a crusty flea market where i fell in love with some $1 pink vintage candlesticks. everything happens for a reason! 1. virginia woolf at tasty n sons. 2. feta, fried sage, butternut squash and carmelized onion frittata. 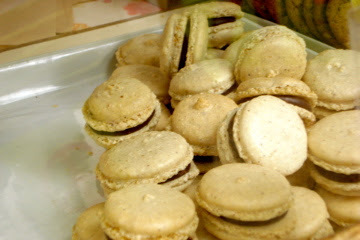 4. i ate macarons from three different places in one day. i call it "research". 6. anyone know what these are? 7. we exercised a little. 8. margarita, chips and guacamole to sabotage the aforementioned exercise. 9. fate brought me to these beauties. happy friday! i love all things andrew bird, but this song in particular is so beautiful. the violin kills me every time. though i have a million and one things to do this weekend like tend to my never-ending pile of schoolwork and pack for our move (next week! ), i'm looking forward to dodging my responsibilities a bit to hang out with drew's dad. we've got a wine tasting, a hiking trip, and so much delicious food planned! i'm kind of on a soup kick. it's just so easy. throw a bunch of ingredients in a pot, and you have a delicious meal in an hour or less. almost as easy as ordering thai take-out (which we've been in the habit of doing quite a bit lately). so, i decided to combine forces and make this thai noodle soup! in a large soup pot, on medium heat, saute shallot in the sesame oil until translucent. add in ginger, mushrooms and salt and saute for another 3-5 minutes. 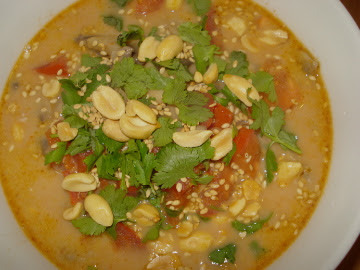 add in curry paste, broth, coconut milk, lime juice, thai basil and diced tomatoes and bring mixture to a boil. once boiling, reduce to low and let simmer for about 20 minutes. meanwhile, bring a smaller pot of water to a boil and add rice noodles. follow cooking time instructions, drain and rinse with cold water. 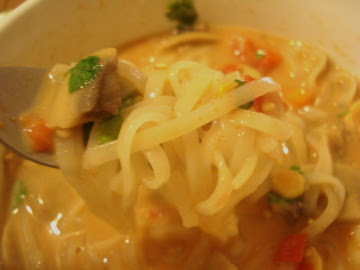 place noodles in a bowl, top with soup mixture and garnish with any (or all) of the items listed above. i also added baked tofu to my bowl, but any protein will do. to say i haven't given any thought to halloween this year would be an understatement. this halloween weekend we'll be moving to the studio, celebrating our third anniversary, and drew's dad will be visiting! i still have no clue what i'm dressing up as. 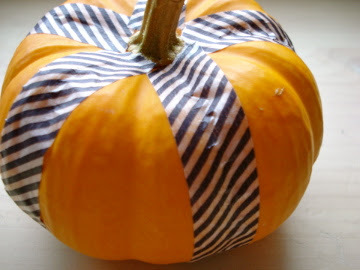 that's why, when i found this little "craft" on real simple, i decided that i had to make it. 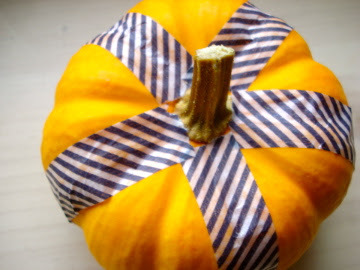 it was such an easy and adorable way to decorate for halloween without exerting too much effort or thought, which i'll need a lot of when i'm costume brainstorming at the last minute! how wonderful is this band? two new yorkers who are trying to revive 1920s-1940s french swing music. i can't help but smile when i listen to them. happy weekend! i was pretty ecstatic yesterday when i saw a color spotlight on chartreuse. my favorite color that has always been the object of ridicule (ew! you're painting your room pea soup green?) was quoted as being "hot right now". perhaps chartreuse is finally gaining the respect it deserves! 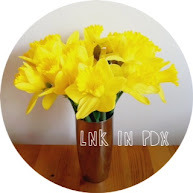 head on over to apartment therapy to check it out. last week i decided to rethink a trend, but one trend i'm still faithful to is ombre. the fading from dark to light is such a simple concept, but it always looks so beautiful on everything. i desperately want to apply the technique to my hair, but i'm too much of a wimp to go through with the bleaching part. happy weekend! i'm currently loving this new feist song. she's playing in portland in november, but unfortunately i'm not sure if i can afford a ticket. i'll state the obvious: moving is expensive. though we did apply for one place that would be incredibly affordable. it's a beautiful space with hardwood floors, all utilities are paid, there's a dishwasher and stacked washer/dryer in the apartment. the only downside? it's a 350 sq. ft studio. like, one room with a kitchen at one end and a bed at the other and a bathroom. we'd move in on our third anniversary. happy anniversary, drew, let's celebrate by living in the closest quarters imaginable! when it comes to this year's trends in fashion and design, i have almost no qualms. polka dots, stripes, ombre, they're all wonderful. one trend that i will also admit to loving is the native american or southwestern trend. this is mainly because i grew up surrounded by traditional native american designs and artwork, an aesthetic my father is very partial to. but i am not native american, and i have no concept of the struggles faced by native americans to preserve their culture and have it remain sacred. through my studies of native american college students in my graduate work, i have gained more of an understanding of the challenges these students face on a daily basis. i can't imagine their frustration when they see non-native american students wearing shirts with a giant dream catcher printed across them and fringed at the bottom. this article, in particular, is so powerful. i'm going to make a conscious effort from now on to rethink this trend. though i find the designs beautiful, i no longer want to purchase items that lose that beauty and authenticity by exploiting native american culture. all i wanted was comfort food, so i whipped up one of my favorite dishes from my childhood: my dad's portuguese kale soup, or caldo verde. 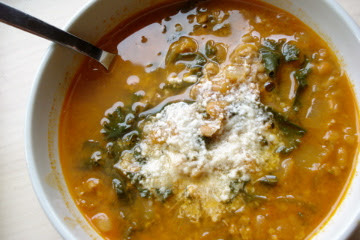 this soup consists of a spicy broth with garlic, herbs, kale and... chorizo. the chorizo adds incredible flavor to the soup, but alas, i don't eat meat. enter trader joe's soyrizo: same spices, same flavors, no animal slaughter involved. my version of his soup is comforting, delicious and healthy (and cures hangovers). you can't even tell that it's vegetarian. in fact, when i go home for christmas, i'm going to make this for dad and i guarantee that he won't notice the difference (don't worry, he doesn't read the blog, he's technologically challenged). in a large soup pot, heat olive oil on medium heat. add the onion, soyrizo, salt and pepper, stirring occasionally for about 5 minutes. then add the beans, kale, rosemary and broth, cover and bring to a boil. once boiling, reduce heat and simmer until the kale is tender. i mashed the beans with a potato masher to give the soup a chunky and creamy texture, but that's optional. serve with a squirt of fresh lemon juice and a sprinkle of parmesan cheese, and wait for its magical healing powers to kick in so you can get your hungover self off the couch. happy friday! besides this being one of my favorite songs, i thought the title was appropriate. where you'll find me now.. has yet to be determined. this whole weekend will be dedicated to looking at apartments. that's right- drew, penny, and i will soon be squeezing into a little one bedroom of our own. i absolutely hate moving, but i'm excited to put the hours i've spent on pinterest and apartment therapy to good use! lately i've seen anna bond's adorable and simple designs all over the blog world, and after a little digging, i found that a handful of her rifle paper co. products are sold in anthropologie stores! i had a seriously hard time choosing one item, but i finally settled on some recipe cards for a project that i'll be working on soon. 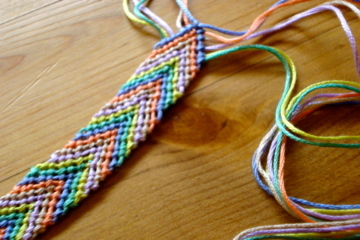 when i think of woven friendship bracelets, two words come to mind: summer camp. buying the different colors of string used to be the highlight of my visits to the camp store. afterward, i'd sit around with my friends for hours and churn out bracelet after bracelet. so imagine my surprise when i started to see these colorful blasts from past on the wrists of models in fashion editorials! soon after, retail stores began selling them (for a rip-off price), so i decided to make my own. the little summer camper in me squealed with delight as i found myself in a craft store buying string once again. i'm not sure how these bracelets made their way back to being relevant, but i'm sure glad they did. well, this weekend turned out to be rather rainy and cold. i'm not sure if it's here to stay (for the next ten months) or if this is just a fluke. i don't actually mind the weather now that school has started. my law class requires an absurd amount of reading and writing time, more than i have ever been faced with, so i'm grateful that i don't have to worry about gorgeous weather tempting me to neglect my studies. 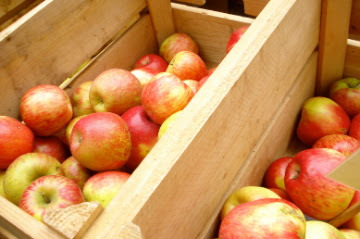 on saturday morning, i was at the gym when it occurred to me that i hadn't been to the portland state farmer's market in a long time. i made a stop there on my way home and indulged in far too many macarons, chocolates and cheese samples. note to self: don't go to the farmer's market right after running 4 miles. oh, and remember chris? he moved here! he lives in a great area right down the street from us, which finally gave us an excuse to try the nearby grilled cheese grill. i got the havarti, tomato, honey mustard + avocado on whole wheat. it was exactly the comfort food i was craving on a rainy sunday. 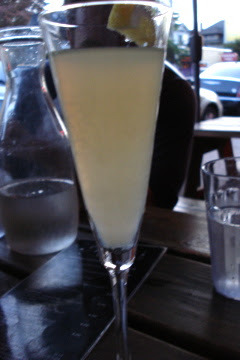 1. the goldenrod: champagne, absolut pear, st-germain and lemon. 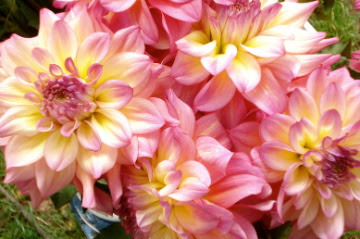 3. dahlias, my favorite flower, were abundant at the market. 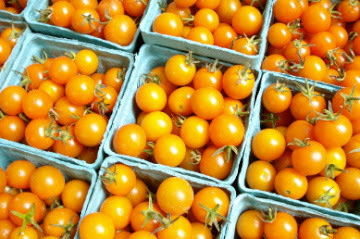 4. baby sun gold tomatoes. 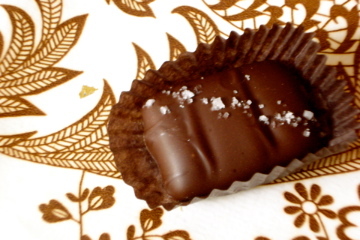 6. lavender infused caramel covered in salted dark chocolate. 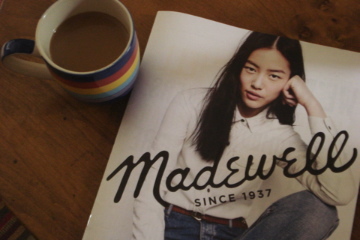 7. sunday morning coffee and pleasure reading. 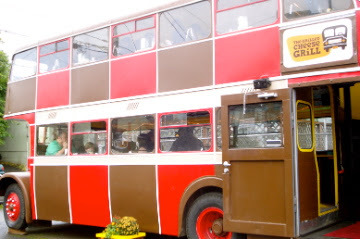 8. the double-decker bus where we ate. 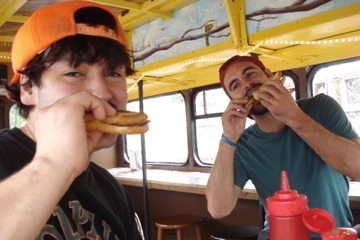 9. jay and chris, in all their grilled cheese glory.